I was 13, I think. Three months shy of 14. Of all the games of that season – the year of banal mundanity, of ineptness, the summer of Odsal, the year of a thousand and one different (loan) faces – that’s the one I remember the most. Bradford City lose 5-1 at home to Crewe Alexandra and endure their heaviest defeat of the campaign. I think that lap of honour humiliation is permanently etched onto my brain. Only a scattering of fans remained there to applaud. Some of them were booing the players. I remember a handful of teenage boys cooing over David Syers. The greatest indignity of a season of mediocrity takes place amidst howling wind, driving rain plunging down sparse streets as the world speeds off, angrily, quietly, taking refuge from the final chapter of a season in which nothing had ever really felt right. I am 18, I know for definite. Three months shy of 19. Of all the games of this season – the year of false starts, of wrong turns, of big calls, of tinkering, of getting stronger, of growing as one, of burgeoning, of riding the crest of the greatest wave – perhaps this will be the one I remember the most, five years on from now. Or maybe it won’t be. Maybe there’ll be three more twists, three more turns. But it felt like a culmination of something. It caught the zeitgeist of the Phil Parkinson era. Bradford City beat Chesterfield 2-0 in their final game of the regular 2011 season and embark on their lap of honour to the words, “Ladies and gentlemen: your League One play-off semi-finalists.” Every single fan stays there to applaud. Children call the players’ names, desperate for an autograph, a handshake, a shirt. Tony McMahon beckons a young girl onto the pitch, hands her his drenched shirt, and she runs back to her seat, beaming. Reece Burke does the same, throwing his boots in with the bargain, too. Those kids will remember those moments forever, keep their heroes’ jerseys close as long as they live. Half an hour earlier, Jamie Proctor had lost a fifty-fifty and looked visibly upset. “Keep going, Proctor! Unlucky!” we call, from the front row. He’d given everything. Now, he soaks up the adulation like the rest of them as they wind round, as the throes of We are going up ring out from all around. The crowning moment of five years of unprecedented progress takes place on one of the hottest days of the year and we enjoy a party that no one wants to leave. We want a repeat of We’ll sing in the dark. We can forget about the rest of the world. There is just us, only us, in a moment that feels infinite. 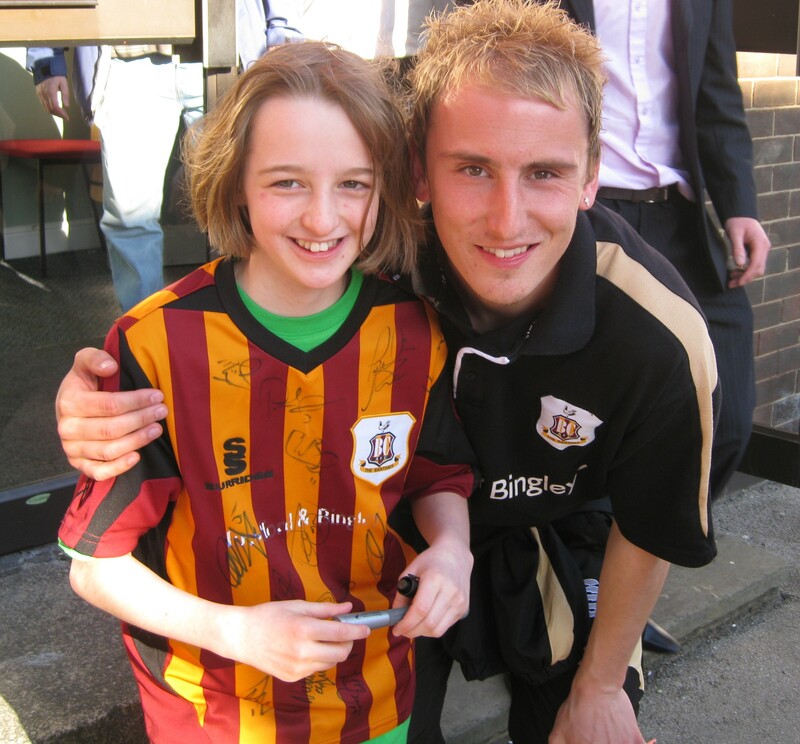 It’s weird, looking back on growing up with Bradford City. I didn’t get the full whack of the decade of decline – I got the last five, six years. And, truthfully, I remember the first two quite fondly, because, you know, Stuart. I was ten, eleven years old, the age where you wistfully overlook players’ shortcomings because you love what it means to be a football fan. But there was a nice feel around the club. I met McCall on a school trip to Valley Parade, and we chatted at length and he was great. My favourite player, Mark Bower, gave me his shirt when I was 11. That was my childhood with City. I pretended to be Luke O’Brien, Dean Furman, David Wetherhall, Rhys Evans, Scott Loach. That’s not a bad selection by any means. And then it began to fall apart. Maybe those next few seasons were the first time I’d felt angry or lost or disillusioned about what my club meant and stood for and was it was turning into. I didn’t know what we were, who we were. I didn’t see a way out. I didn’t get how Peter Jackson could leave so early. I didn’t like how Peter Taylor and Zesh Rehman fell out. I didn’t like how high the stakes were getting. “Would you watch Bradford City in the Conference?” rang out as an insistent, perpetual backing track to the conversation. I didn’t like that we nearly left Valley Parade. I didn’t like that we were playing for our own existence. I grew up quickly, as a football fan, in many ways . I learned dreams don’t always come true, that promises don’t always materialise. But I kept coming back, because this team were mine. They kept letting me down, but I belonged to them and they belonged to me and we had to pull through this together. Stowed behind my bedroom door at home, in two cardboard boxes stacked one atop the other, is a selection of already yellowing newspapers and crumpled photographs. I don’t look at them often, to be honest. Life moves on, the world turns, another giant falls. But my pride never dies. We did that, I think, as my hands trace the dissolving typeface, eyes scan the headlines from the day my world stopped spinning. The voices ring out, echoes of a past that’s never died, of moments eternal in their clarity, their magnitude. “We are dreaming again, Martin! We are dreaming again!” I find the City-Villa half-and-half-scarf, find it bizarre that such a landmark fixture could become the norm next season. For a moment, I am the 15 year old from the photographs again, braced teeth askew, mouth upturned into a smile, Matt Duke with his arm on my shoulder, two Mona Lisa smiles as the years fall away. I was a quiet 15 year old, to be honest, with not a great deal of confidence. 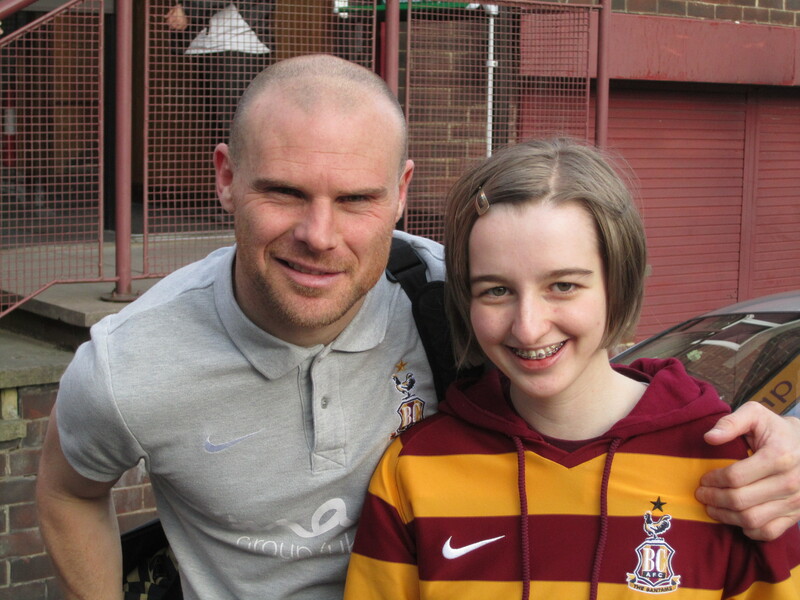 Bradford City were the centre of my world and Gary Jones was my hero. They were the one thing I looked forward to every single week. Nothing ran them close. When I was with them, I was younger than 15. The glass ceiling was shattered. Anything was possible. The world was limitless. And with them, it still is. I understand his reasoning – look at how indifferent we all used to be towards Manchester City. Leicester are officially the greatest team in the country right now, but the soundtrack to their endeavours would have, at times, appeared curious if you weren’t properly affiliated with their backstory and the climate of top-flight football in this country. They’re the best team in the country, but they’re quaint, and cute. Ranieri buys them pizza when they keep a clean sheet, and found out the Tottenham-Chelsea result later than everyone else because he took his mum out for tea in Italy. It felt like the whole world patronised them at the same time they couldn’t help but take them seriously. But maybe that’s not the whole story. I watched Leicester City’s title triumph in awe and admiration, like the rest of the country. Potentially, nothing will ever top that achievement. But one of the things that upset me was just how startled everyone was by the Foxes’ resilience, by their spirit, by their refusal to know when they’re beaten. That this rag-tag, hastily assembled team of the players that time forgot and the men who slipped through the net could become something greater than they’d ever imagined. Narratives of redemption, of second chances. As a Bantams fan, I was kind of, like, ‘Oh.’ That wasn’t the striking part, for me. I wasn’t shocked by that side of what they’d done – because we’ve seen it all before. In the painfully stratified landscape of global football, it is the essential humanity of teams like Bournemouth, of teams like us, that brings us back to what is truly important. Everyone tells us, constantly, that we shouldn’t still believe in football. It rarely covers itself in glory. And there are a lot of things I don’t like about it. Stuff like Tuesday night gets attention for all the wrong reasons. Players are overpaid. They do questionable things, on and off the pitch – Leicester’s players aren’t exempt from this. But I think Howe is wrong in using people’s opinions as a measure for success. It’s not a case of being taken seriously, but of your integrity, and what you stand for. Of who we are. Of how far we’ve come. Of what you want your legacy to be. We are a model for every single football fan who has ever been scared or angry or anxious or terrified about the certainty of their club’s existence. Northampton Town, too, after what they’ve been through this year. There is a way out and a way forward and you can go on to do things greater than you ever thought possible. Eight years ago, Kevin Keegan felt that the Premier League was dead. The glass ceiling was set irrecoverably in place. “This league is in danger of becoming one of the most boring but great leagues in the world,” he said. “The top four next year will be the same top four as this year.” Manchester United, Chelsea, Liverpool, Arsenal. Repeat, repeat, repeat. But everything has changed, the world over. I like being ‘the Bradford fan’ at university. My Scouse flatmate asks me on a weekend, “Who have youse got today?” And it makes my day, because I know that ‘youse’ isn’t just me (and not just by virtue of the fact it’s a plural), but something bigger than me, bigger than both of us. And I’m so proud to stand for that. I’m proud to be his byword for Rory McArdle, Stephen Darby, Reece Burke. And I’m proud that those players represent me. 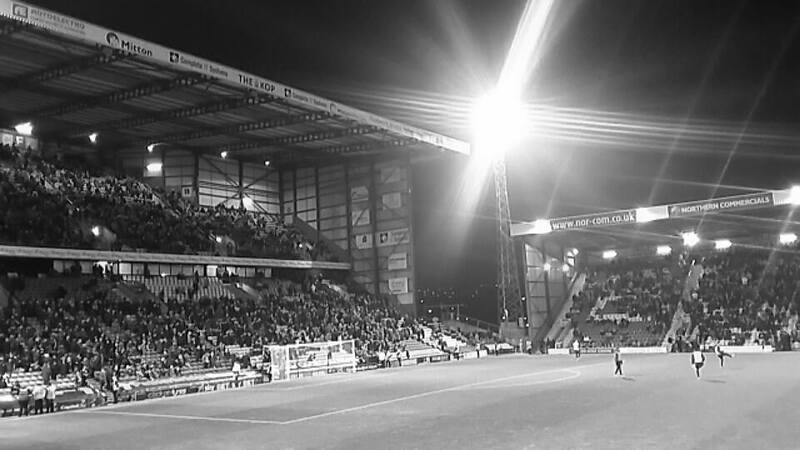 I’m proud that I’m Bradford City, and I’m proud that Bradford City is me. I’m glad that I found City, and I feel so lucky that they found me. I hope we never lose this. I hope this never ends. People tell you the higher you go, the more impersonal things become. I have friends who are on waiting lists for tickets to watch their clubs in the Premier League. I hear press conferences go from one-to-one interviews to a full room of journalists with five press officers vetting questions. You hear of top flight players blanking fans. Billy Knott played football with some kids before kick off a few weeks ago. Gary Jones and Jake Turton. Gary Jones and me. One day, those kids will grow up. They might be too old to wait for pictures and autographs then. Maybe their players, their heroes, will lose that aura, that coat of invincibility. They’ll just be men who are good at football. And then you’ll get to an age where you start being older than these players (shout to Marcus Rashford). They’ll become your contemporaries. And then they’ll be just kids to you. I am proud, so proud. Of us. Of who we are and where we’ve come from. Of the road we’ve walked, together. When I see my team, my Bantams Family, walk out in front of the Sky Sports cameras at noon on Sunday to face Millwall in a League One play-off semi-final, all I will be able to do is smile. The past four years have been the best trip I have ever, ever, ever been on. I feel so lucky that we have this team, that we have Phil Parkinson. That they understand us, get us, know what this means to us. No matter where the road takes us, where the journey ends – at Wembley, or prematurely at the Den on Friday – that will never change. We will keep making history. Everywhere we go. My Bantams Family and me. You express the all-consuming nature of a young fan in the “first flush” of love for her club very well, its an emotional read. I can’t describe myself as a life-long fan – my loyalties have been fickle, one might say, but I have “grown” into a City fan that follows Liverpool and hates ManU, and is beginning to understand those cynical old gits who bored me in my earlier years by moaning that “football’s changed, its not like it used to be ………” etc. True, money rules, Big Clubs alter everything to suit them, The History Of Football started in 1992. But City and Bournemouth have played in the top league, City went to a Wembley final as a 4th tier side, and now Leicester! And like you I pinch myself when I sit in a modern,safe,nearly-full stadium, and watch My City (and yours, and everyone elses) play out a nice 2-0 win, celebrating more playoffs. And think of playoffs – one against Boro I was dimly aware of – a drubbing by Blackpool (I saw) and a drubbing of Blackpool (I have a video) – and The Other Wembley day – when we turned up! Great sentiment Katie and well written piece. Keep on believing. See you at wembley. If we successfully negotiate these play-offs we could do well in next season’s Championship. Good to read about your memorable experiences of growing up as a Bantam. They will stand you in good stead for the years ahead that will undoubtedly be full of some tears but lots of joy, all claret and amber! Katie, you’re lucky and you’re right. Lucky to be supporting football when it’s fashionable and safe and right that there is no greater feeling than being part of the Bradford City family – it is unique – and I speak as someone who attended his first game in 1969 (and I know there are people who have supported BCFC longer but one can’t determine the year of one’s birth!). The Phil Parkinson years have been, and will, hopefully, continue to be an upward journey. I cannot believe there are many clubs out there that have the connect with the supporters that we can enjoy. Having experienced drudgery, astonishing lows and the mocking of my mates when I was at school (everyone was either Leeds or Man U) I, like you, am incredibly proud to be a City fan. I can remember resigning myself to the fact that I would never see my team in the top two divisions, then 1985 happened. I never, in my wildest dreams, thought I would ever see my team in the top division, let alone Wembley. And yet, here we are, on the cusp of a fourth visit in my lifetime! It’s not a dream, it’s real. Wow! Katie you have a talent for getting to the heart of what it means to support City articulated so perfectly. These are exciting times for all of us so proud to be part of the Bantams family.